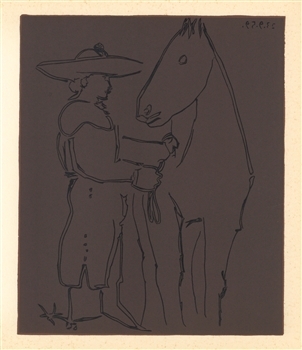 Pablo Picasso linocut "Picador and Horse"
This impression from the sought-after 1962 edition (published by Abrams) was done on heavy wove paper with a richly textured printed surface. The sheet measures 12 1/2 x 14 1/2 inches (318 x 365 mm) and the image size is 10 1/2 x 8 3/4 inches (270 x 223 mm). Not signed.